I agree with this sentiment – selected topics from a broad population, and broad topics from a selected population. When it comes to learning about particular subjects, it’s right on. 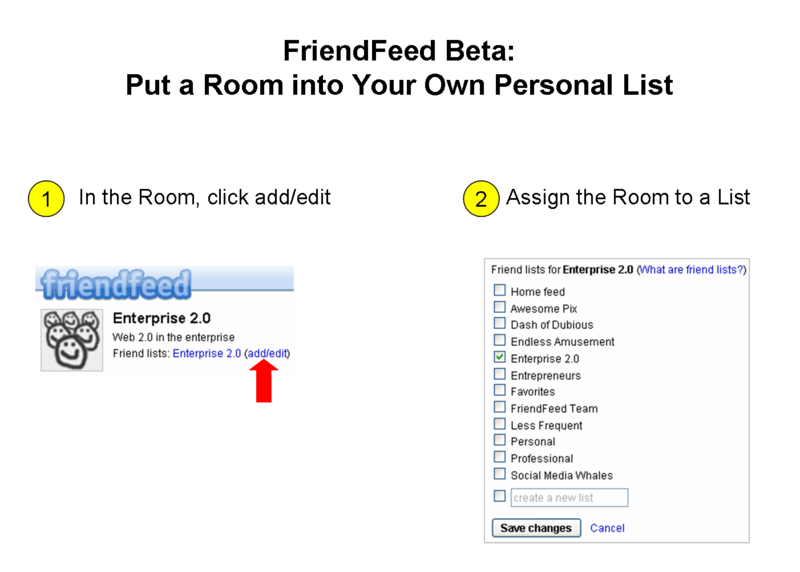 FriendFeed’s beta version now gives you the ability to do exactly what Fred Wilson suggests for any topic. I’ll describe how I’m using them to track developments in the world of Enterprise 2.0. About three months ago, I tried a little experiment. 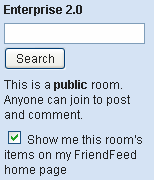 I created the Enterprise 2.0 Room on FriendFeed. Not having time to be a Room Community Manager, I set it up to stream in content related to Enterprise 2.0. I did this as a search on FriendFeed for “enterprise 2.0“. Well, the idea was neat. The actual implementation pretty much blew. Because a search on FriendFeed, piped into FriendFeed as an RSS? It produces a lot of recursive results. Made the room pretty noisy and not particularly attractive to follow. I’m piping in RSS feeds from Twitter and Del.icio.us. Twitter is great for those little hits. The links to content. The expression of a single perspective. And Del.icio.us is great for leveraging what people decided was worth saving. Rooms can be set so that their entries don’t hit your Main FriendFeed stream. You can un-check the box there that says “Show me this room’s items on my FriendFeed home page”. This works fine for Original FriendFeed. The other option is to use Beta FriendFeed. In Beta FriendFeed, Lists have become the cool new feature. I have to admit, I’m finding it a lot easier to manage content via Lists than Rooms. You can create a List called Enterprise 2.0. Rooms can be added to Lists. As if the Room was some sort of person on FriendFeed, streaming all sorts of content. Cool idea. As you can see in #2 above, I’ve taken the Enterprise 2.0 Room out of my Home Feed. It only pipes into my Enterprise 2.0 List. The cool thing about using Lists is that you can supplement the Twitter and Del.icio.us feeds of the Enterprise 2.0 room with other people or Rooms you like. For instance, I’ve included the FriendFeed accounts of Dion Hinchcliffe, Charlene Li, Ross Mayfield, Thomas Vander Wal and others into my personal Enterprise 2.0 List. For people not on FriendFeed, I also have created imaginary friends to pipe them into my List, such as the tweets of Harvard professor Andrew McAfee. That pretty much describes my List set-up of the Enterprise 2.0 Room + specific FriendFeeders. If you’re interested in a single place to track the happenings of Enterprise 2.0, I invite you to join the Enterprise 2.0 Room. Then personalize things with your own List. If you think of any search terms or data sources I should add, please let me know. And feel free to start your own Rooms and Lists for topics you care about.